Publisher Taschen has added some new titles to their Little Book series and sent some over for me to check out. The titles that I have are for Spider-man, The Avengers and Captain America. Each book is a palm-sized 192-page paperback that's quite affordably priced at US $10. Let's talk about Spider-man first. 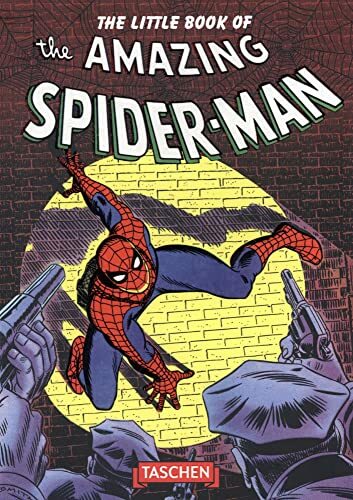 This book is a quick guide to how Spider-man has evolved over the years since it was first introduced. The pages are filled with comic pages and covers with captions that talk about the creation process and sometimes reception of those titles. You'll get to see the early works of Steve Ditko, John Romita and later on, artworks from other artists. I particularly enjoy the behind-the-scenes insights when they talk about page design and storytelling. This book is by no means a comprehensive guide to Spider-man. It's meant for some light and casual reading and should serve well as a introduction to Spider-man comics. Thanks for featuring these! I didn't know Taschen had anything in this price range. The Spiderman and Fantastic Four books are both under $5 USD today at Amazon.com, which is a great deal. There are also similar books for Superman, Batman, and Wonder Woman. The book is fun to skim. The paper quality is good and the book is very sturdy. I wish the book was maybe 10-20% larger. The pages are very stiff and takes some effort to hold it open. Except for the small introduction, nearly all of the text in the book is in the form of captions for the images. There is a good variety of artwork. The early years are the main focus with a few bits from recent years. I think it would appeal more to grown-ups than to children as it covers some old-fashioned artwork and some fairly dry captions. For me, it's excellent for very casual reading.